The problem of Inverting a Binary Tree has got some hype after following tweet. As a problem-solver, I was wondering how to approach this problem, as it seems to be a great application of structural recursion. In this post, let’s see how to solve it with functional programming and Scala. The problem can be specified as follows. Thus the function invertTree essentially has following signature. First, we define a Binary Tree ADT. In order to conveniently encode tree instances, we add following methods in the companion object of Tree. As a result, we can define an instance of a tree in Scala REPL as follows. Also, we can define a map function that applies a function f: A ⇒ B on the value of each Node. Note that the application of map is always structure-preserving, that is, it retains the existing shape as it was before application (unlike the aforementioned size function) and perform only local transformations. In essence, invertTree simply swaps left node with the right node, and thus derives the resultant tree with the generic fold. Neat..uh? By the way, this problem can be solved in several ways. This post particularly demonstrates the application of structural recursion in a generic manner (e.g., with fold), which is the essence of #fp, imho ;). If you have any question/suggestion or a different idea to solve this problem, please free to post it as a comment; I highly appreciate that! Thanks for visiting! The UVa 10664: Luggage is a typical example of the problems that can be solved using dynamic programming (DP) technique. In fact, after further analysis, this problem can be realized as a special case of Subset-Sum problem, which we have discussed in a recent post. The following Java code snippet outlines an algorithm using dynamic programming to solve this problem. Notice that the function solveLuggageProblem applies a bottom-up DP to construct dpTable. The boolean value of each dpTable[i][j] implies that whether it is possible to achieve weight j from the weights of 1..i suitcases. In this way, it determines whether halfWeight — the half of the total weights (of the suitcases)– can be derived from using 1..n suitcases, i.e., whether the weights of suitcases can be distributed equally into the boots of two cars. Please leave a comment if you have any question regarding this problem or implementation. Thanks. SPOJ 97. Party Schedule (PARTY) with F#. SPOJ 8545. Subset Sum (Main72) with Dynamic Programming and F#. The UVa 100: The 3n+1 Problem is about collatz problem, which we have discussed in details in a recent post. The following Java code describes a brute-force algorithm to solve this problem. In addition, a memoization technique is incorporated to reduce redundant computations and thereby, to enhance efficiency of this brute-force algorithm. Please leave a comment if you have any query. Thank you. 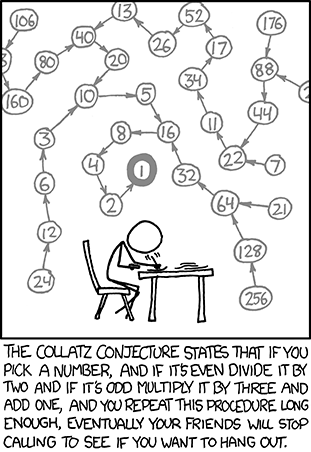 Collatz Problem a.k.a. 3n+1 Problem. 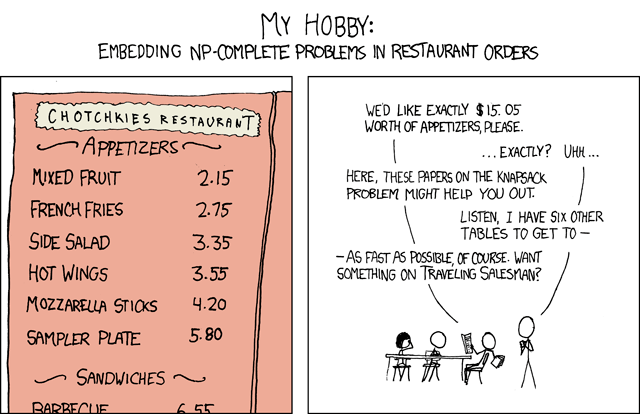 This post focuses on Collatz problem, which is also known as, among others, the 3n+1 problem, and the Syracuse problem. Outline. We begin by introducing Collatz conjecture; afterwards, we presents an algorithm to solve the problem (UVa 100 or SPOJ 4073) published in both UVa and SPOJ. The primary advantage of having it in SPOJ is that we can use F# to derive a simple and elegant solution; at the same time, we can verify it via SPOJ’s online judge. which implies that if is even, it returns , otherwise . This function is called Collatz function. Consider, for instance, , the generated iterates are following: . This sequence is referred to as Collatz sequence, or hailstone numbers. Collatz conjecture, which is credited to Luther Collatz at the University of Hamburg, asserts that for any positive integer , the repeated applications of the Collatz function, i.e., eventually produces value ; that is, , where denotes application of . Considering , it follows: . The generated sequence of iterates: is called the Collatz-trajectory of . For instance, beginning from , the resulted sequence converged to as follows: . Therefore, Collatz-trajectory of 26 is . Note that, although Collatz problem is based on this simple concept, it is intractably hard. So far, it has been verified for by Leaven and Vermeluen. In the rest of this post, we intend to solve the problem, which is essentially a restricted or bounded version of the Collatz problem. Interpretation. It restricts the iteration by exiting as soon as the Collatz sequence reaches to value 1 at . For = 26, the resulting Collatz sequence is therefore: , and length of the sequence is i.e., 11. This problem asks to compute the largest Collatz sequence that results from any integer between and , which are provided as inputs. Note that, the value of and are both positive integers: . A naïve brute-force algorithm redundantly computes sequences again and again. Consider =13 and =26. For = 26, we also compute the sequence for 13 that has already been computed during = 13. We must apply a tail-recursive implementation to compute the sequence, as naïve implementation might results in stack overflow. As we shall see next, we have optimized the naïve implementation considering the above observations. First, we define function, nextCollatz, that returns next integer of the Collatz sequence, given an integer . In effect, it computes from as follows. Using the algorithm outlined in collatzSeqLength, the length of the Collatz sequence is computed for any given integer . Memorization has been incorporated to effectively optimize the algorithm by avoiding redundant computations of the sequence and its length, which in turn provides a faster algorithm than its naïve counterpart, albeit with the cost of additional space. Tail-recursive algorithm enables computation of Collatz sequence with larger . Continuation-passing-style has been applied in this algorithm to accommodate, and to combine tail-call optimization with memorization. The following snippet demonstrates how the maximum sequence length is obtained by invoking collatzSeqLength for each integer between the given and . Complete source code of this problem can be found in this gist. Following IDEONE page (with sample inputs and outputs) has been provided to further play with the code (in case of the unavailability of F# in local system). Java source code is also available for this problem. Try solving Euler Problem 14, which resembles this problem and based on these stated concepts. Please leave a comment if you have any question/suggestion regarding this post. Happy coding! The Party Schedule problem, published in SPOJ website, is about deriving an optimal set of parties that maximizes fun value, given a party budget: and parties: where each party have an entrance cost , and is associated with a fun value . In this post, we discuss how to solve this problem by first outlining an algorithm, and afterwards, by implementing that using F#. This problem is a special case of Knapsack problem. Main objective of this problem is to select a subset of parties that maximizes fun value, subject to the restriction that the budget must not exceed . Furthermore, an additional constraint: “do not spend more money than is absolutely necessary” is applied, which implies following. Consider two parties and ; if and , then we must select instead of . The definition of this problem suggests a recursive solution. However, a naïve recursive solution is quite impractical in this context, as it requires exponential time due to the following reason: a naïve recursive implementation applies a top-down approach that solves the subproblems again and again. It returns the maximum value over any subset where . Our final objective is to compute , which refers to the optimal solution, i.e., maximal achievable fun value from budget and parties. To define the recurrence, we describe in terms of its smaller subproblems. How can we express this problem using its subproblems? Let’s denote to be the optimal subset that results in . Consider party and note following. It , then . Thus, using the remaining budget and the parties , we seek the optimal solution. Otherwise, then . Since is not included, we haven’t spent anything from . where the base conditions can be rendered as below. Using the above recurrence, we can compute for all parties and for costs . In essence, we build the OPT table, which consists of rows and columns, using a bottom-up approach as stated in the following algorithm. Following code builds the OPT table using the stated algorithm. In effect, it does two things: builds OPT table and afterwards, returns the OPT(n,C) and associated optimal cost (due to the constraint “do not spend more money than is absolutely necessary” discussed in background section) as a tuple (see Line 16). Following function computes the optimal cost. Complexity. as each requires time. For the complete source code, please check out this gist, or visit its IDEONE page to play with the code. Please leave a comment if you have any question or suggestion regarding the algorithm/implementation.